Although handwashing with soap and water is preferred, using hand sanitizer, or hand rub, is a much quicker and easier way to clean your hands. It requires no water or paper towels, just your hands. 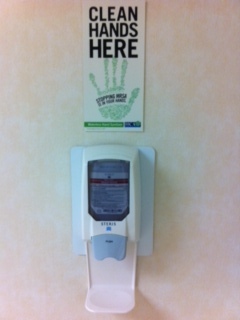 In many hospitals, including the one I work at, sanitizer dispensers are all around the building for anybody to use. I've also seen them in stores and restaraunts over the past few years. There's a reason for this, everybody should be cleansing their hands more. It has become a habit for me to just automatically use the dispensers when I pass by them. You should use it before and after you give care to your patient, or patients if you have more than one even if you wear medical gloves. It is recommended for you to use soap and water when your hands are visibly soiled but otherwise, hand sanitizer is usually acceptable. However what isn't acceptable, contrary to popular belief, is using hand rub while wearing medical gloves. They were not meant to be reused like that. When they get soiled, just grab another pair. There are two different kinds of hand rub. One comes out into a foam while the other is a watery gel. They're both just as effective, they just comes out of the dispenser differently. The amount you should use varies depending on which kind you are using. For the foam, one application should be about the size of a walnut. For the watery gel, one push of the dispenser should usually be enough although people with larger hands may require two. As soon as you get the right amount, you should quickly rub the sanitizer all over your hands and wrists. Make sure you get both sides of your hands, between your fingers, and under your fingernails. If you feel part of your hands are still dry, just apply another push until you feel it all over both of your hands. Keep rubbing over and over again until all of it dries which should take no longer than 30 seconds. If it takes longer, you used too much. Like handwashing with soap and water, using sanitizer can dry out your hands. This is by no means a reason to stop using it, just moisten up your hands with lotion every now and then. Don't believe it when people say hand rub is a useless form of hygiene. If it was useless, it wouldn't be so widespread especially at commercial places like hospitals. It's safe to say soap and water is better, but when time is limited, sanitizer works just fine. I think we are going to see hand rub more and more as the years go by and that's certainly a good thing. 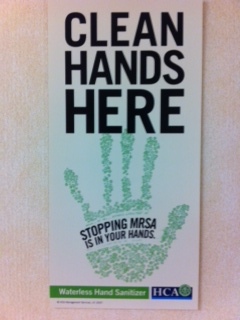 Many people won't take the time to use soap and water but can't resist using hand sanitizer when they see a dispenser. This helps everyone and should be encouraged. It's the start of a healthier future for everybody.